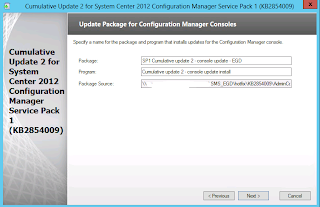 This post describes how to install CU2 for Config Mgr 2012 SP1. 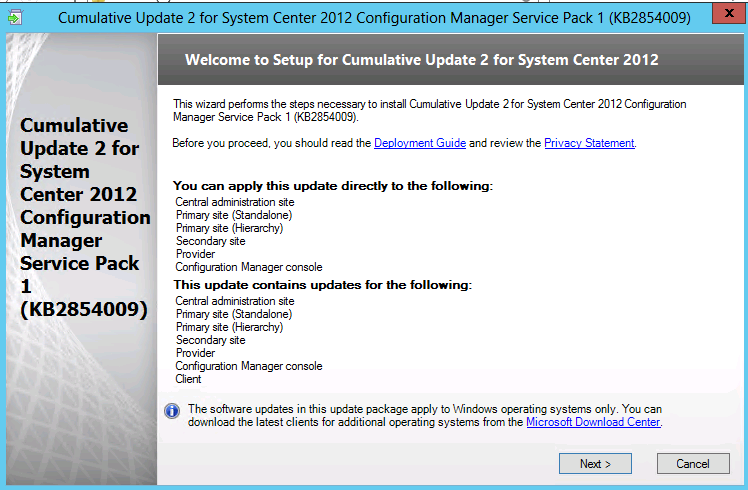 You can download CU2 here (you can also see the list of issues that are fixed by CU2). 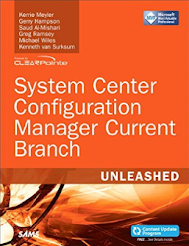 Note that CU3 has also now been released. The installation process is the exact same. 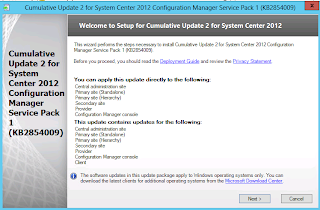 You can download CU3 here (you can also see the list of issues that are fixed by CU3). 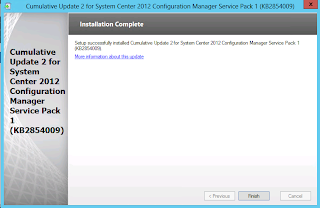 This is the CU2 installation file. Double-click to launch the executable. You are presented with information about the update. 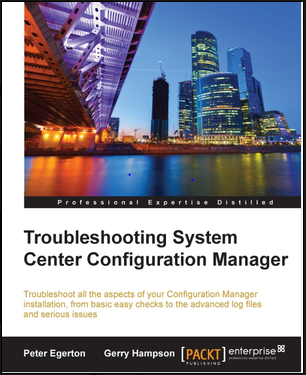 Note that it is only required to install this on Site Systems (ie run the SMS Provider), CM Consoles and clients (you do not have to install on Distribution Points). We will install the update on the Primary Site Server. During the process we are prompted to create packages that we can then deploy to other Site Systems, Consoles and clients. Note that this is NOT an automatic process. 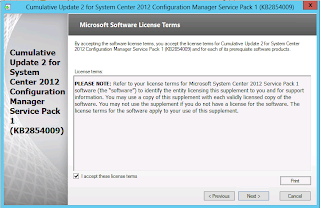 Accept the License Terms and click Next to continue. Verify that all prerequisite checks have passed. Check the box to install the updates for the Config Mgr console (selected by default). Choose to "Update the site database". 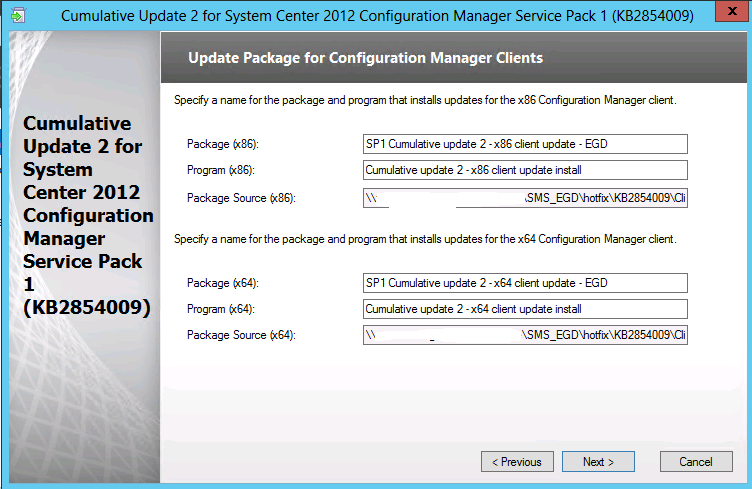 Configure a path for the Server Package. Configure a path for the Console Package. 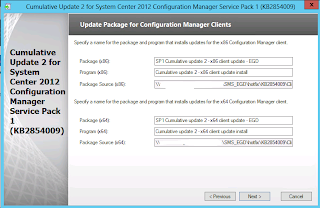 Configure a path for the Client Packages. Review the summary and click Install. Installation of CU2 has been completed on the Primary Site Server. Now you must deploy the update packages to the other site systems and your clients using traditional Config Mgr deployments. I am ruuning sccm 2012 sp1 (without Cumulative updates). can I upgrade directly to CU4 ? Yes, you can Zax. Why don't you go to straight to R2 though? You don't need a CU for this. I still have hundreds of XP that I have to refresh to win 7 using sccm 2012. 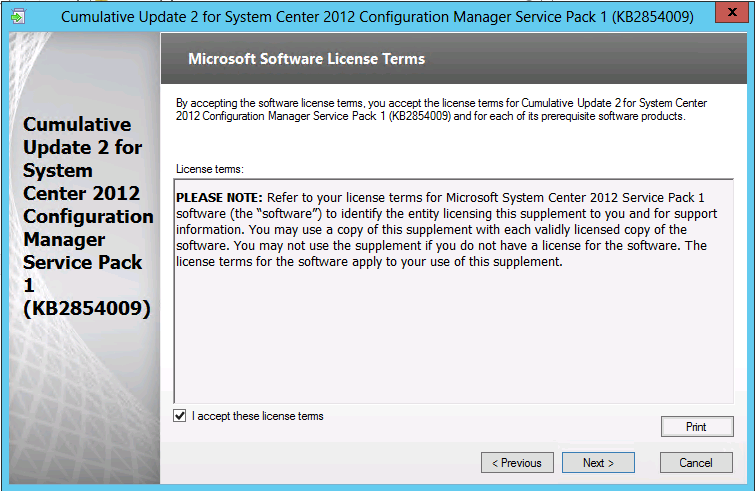 I was told that R2 is using Win PE version 5 which does not support XP. 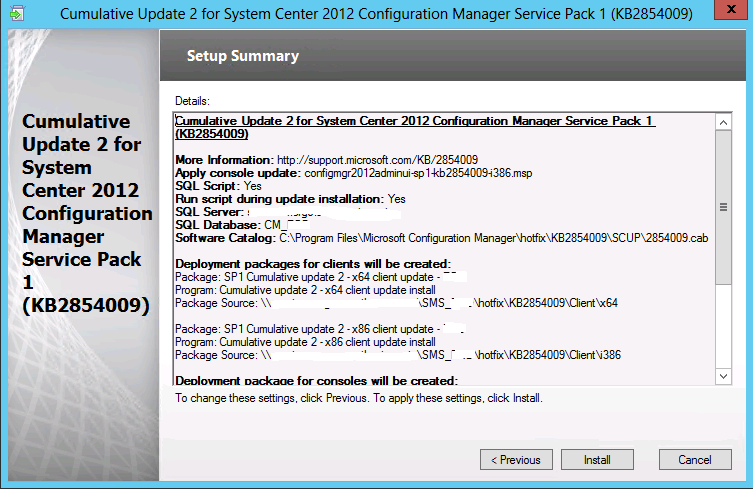 Created a totally new SCCM 2012 R2 environment in a new domain Domain A. - Added the Domain B to SCCM 2012 R2 , ran Forest Discovery successfully. Both MP (Domain A ) and DC (Domain B) can resolve each others DNS successfuly. As it is a same Forest, I assume don't have to set any trust relationship. You only have to extend the schema once per forest. Senior Consultant, Ergo Group. 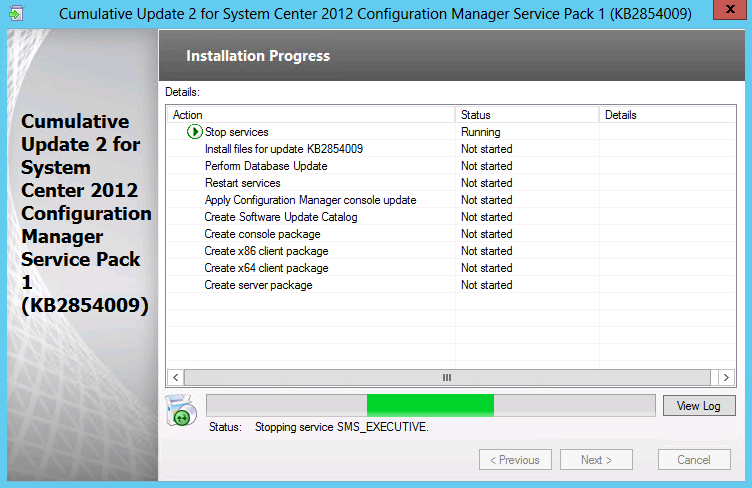 Microsoft MVP in Enterprise Client Management. 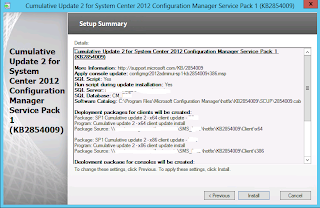 Specialist in Microsoft implementations.